This chapter demonstrates how to set up a wholesale exchange platform with which you will accept calls from your customers (a customer in this context is a carrier whose calls are terminated to your network), and send those calls to the actual carriers. This operating method earns profit from each call. For more information about available fields, click on the top-right corner. Print the following page and use it to check off the operations you have completed while performing the system setup according to the instructions in this chapter. Please be sure to perform all of the operations in the order designated (all of the boxes should be checked,) otherwise the service will not work. If you have just installed the PortaSwitch® software or dedicated a new billing environment to configure the services described in this handbook, make sure to first perform the initial configuration of PortaSwitch®. To do this, use the PortaSwitch Initial Configuration handbook. Route categories are tags (e.g. Cheap or Premium) that you use to designate specific routes so that later you can organize individual routing plans for your customers. It is possible to have a separate route category for every termination carrier, although this is not advisable, as it would make the maintenance of routing plans quite complicated due to the large number of categories in each. The recommended method is to create several route categories (Low-cost, Normal, Expensive, etc.) and then assign each route to one of them. 1. 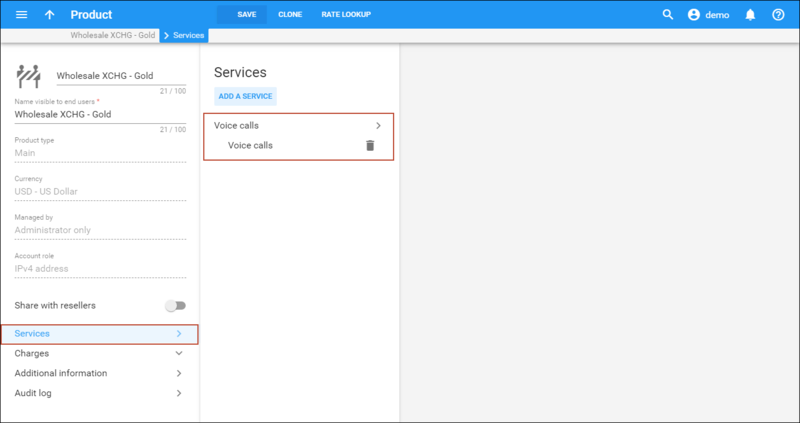 On the navigation menu to the left, select Infrastructure, then Voice calls processing, and in the Routing section select Route categories. 2. On the Create route category panel, enter the route category name and description. 4. Repeat steps 2–3 if you need to create more route categories. The tariff is a price list for your termination costs. · Name – A short name for the tariff object; this is the name you will see in the select menus. · Currency – Indicates the currency the vendor uses to charge you. · Applied to – Choose Vendor, as this tariff describes your vendor’s termination costs. · Routing – Enable the Routing, as this tariff will be used not only to calculate termination costs, but also to route SIP calls. Rates define how a call to a specific destination will be charged (e.g. what the price per minute is, how to round off the total call duration, etc.). Please refer to the Call Billing Parameters section in the PortaBilling® Administrator Guide for more details on available parameters for rating voice calls. Managing rates online is very convenient for maintaining existing rate tables, as well as for reference purposes. For new price lists or for major updates, importing the rates from a file is better. 1. On the vendor tariff’s panel (GlobalNet Termination), click Rates. · Destination – A destination prefix may be entered directly, e.g. 420 for the Czech Republic, or you can access the destinations directory by clicking the Destination link (in the column header). Here you can find the desired prefix by country name. NOTE: You must create an entry for certain phone prefixes in the Destination register before creating a rate for them in the tariff. · Route category – Choose one of the route categories you have created to apply to this particular route. · Preference – This is the routing priority for the specific destination in which 10 is the highest priority and 0 is the lowest (i.e. does not use a destination for routing at all). For now, you can just set all of your vendor rates at a preference of 5, and the system will organize the available routes according to cost (LCR). · First interval, seconds – First billing unit in seconds. · Next interval, seconds – Next billing unit in seconds. · First price – Per minute price for first interval. · Next price – Per minute price for next interval. · Effective from – If you want this rate to take effect sometime in the future, you can either manually type in a date or use the calendar (click on the DD-MM-YYYY link). NOTE: When using the calendar, you can specify that the date you are entering is in a different time zone than the present one. PortaBilling® will then automatically adjust the time. 4. Repeat these steps if you need to enter more rates. Please see the Rate Import section on how to import rates from a .csv or .xls file for complete details. Vendors are your termination partners, i.e. companies you send calls to. · Name – Type a short name for the vendor; this will be used on the web interface (for example, GlobalNet). · Billing period – The period in which vendor statistics is generated. When a call is sent from your network to the vendor’s gateway, the vendor performs an authorization for the call. Authorization can be done based on your PortaSIP® IP address (in this case you just need to supply the vendor with that information and no further action is required on your part), or the vendor can provide you with a SIP username and password to use for call authorization. These credentials should be stored with the “vendor authorization” info and then associated with a specific connection so they can be used during actual call processing. · On your vendor’s panel (GlobalNet), click General configuration, then click Authorization. 5. Repeat these steps to add all of your vendors. Connections represent the points from which calls leave or enter a network and are directed to or from vendors where charges are incurred. 1. On your vendor’s panel (GlobalNet), click Connections. · Type of connections – Select SIP. · Identify gateway by – Choose how to identify the gateway: IP, gateway ID or both. Specify the IP address and / or ID of the vendor’s gateway or switch. · Capacity – Specify the maximum number of simultaneous calls the connection can support (e.g. 50). 4. 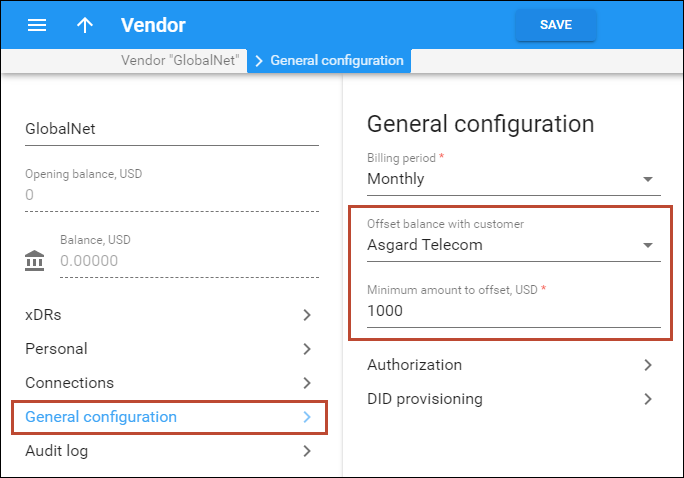 On your vendor’s panel (GlobalNet), click General configuration. · Vendor authorization – Select GlobalNet-SIP for digest authorization of outgoing calls from your accounts. 6. Repeat these steps to add more connections to this vendor. 7. Repeat steps 2-6 to add connections for other vendors. · Name – Type a short name for the tariff; this is the name you will see in the select menus, (for example, Wholesale XCHG - Gold). NOTE: The currency for the tariff is only chosen once and cannot be changed later. · Applied to – Select Customer as this tariff will be used to charge your customers. · Managed by – Select Administrator only here, since we are setting up a service without the involvement of resellers. 4. On your customer tariff panel (Wholesale XCHG - Gold), click General info. · Default off-peak period – If you do not differentiate between peak and off-peak rates, just choose None; otherwise, select one of the previously defined off-peak periods. · Destination group set – If you wish to enter rates in the tariff, not for every individual prefix, but for a whole group of prefixes at once, you should create a destination group set and the destination groups beforehand. Leave this select menu empty for now. · Round up to, decimal places – Instead of calculating xDRs with 5 decimal place precision, round up the xDR amount values (e.g. in cents, so that 1.16730 becomes 1.17). · Default formula – This is the default rating formula, which is applied to every rate created in the tariff. If you leave this empty, the “old-style” rating is used. · Short description – Type a short tariff description. This is shown in the rate lookup on the admin interface and the self-care pages for your accounts and customers. · Description – Type an extended tariff description. 1. On the tariff panel, click Rates. · Destination – Select a destination prefix from the list or type it in directly, e.g. 420 for the Czech Republic. · First interval, seconds – Type a first billing unit in seconds. · Next interval, seconds – Type the next billing unit in seconds. · First price – Type a per-minute price for the first interval. · Next price – Type a per-minute price for the next interval. · Effective from – If you want this rate to take effect sometime in the future, you can either manually type in a date, or use the calendar (click on icon). Perform the Create Tariff and Enter Rates steps described above until you have created a tariff for each of your clients’ billing schemes; these tariffs are created as “Applied to: Customer.” For example, if you plan to have two types of clients (e.g. Silver and Gold) with different rates, you will need two separate tariffs. A routing plan allows you to apply individual routing methods to certain customers, i.e. to block them from using certain carriers for termination, or, conversely, to only allow them to use certain carriers in a specific order. If you do not define any custom routing plans, the system default routing plan which allows access to all available carriers is used. 1. On the navigation menu to the left, select Infrastructure, then Voice calls processing, and in the Routing section, select Routing plans. · Name – The name of the routing plan. · Define a specific order for the route categories – Enable this option. · Description – Describe the intended purpose of this routing plan. · Order – Define the route category order in the routing list. Higher numbers will be at the top of the routing list. It is possible to include two or more categories with the same order number; in this case, PortaSwitch® simply sorts the routes according to preference and cost. If you do not include a certain route category in the list, customers will not have access to any routes in that category. · Route category – Choose the route category that you created earlier from the list. · Click the Save button in the toolbar, or the icon on the right hand end of the row. · Repeat these steps if you need to include more route categories. · Use both absolute and relative profit parameters – Select this checkbox to enable the option. · Absolute profit parameter – Select Minimum required profit here. This parameter allows you to create a more aggressive profit guarantee route selection: the vendor’s cost per minute must be lower than the customer’s rate by at least the amount specified. · The minimum amount of required profit, USD/min – Specify the value $0.0001. · Relative profit parameter – Select Minimum required profit here. This parameter allows you to specify a relative threshold, so that for expensive destinations the profit is high, while for low-cost destinations a small profit is acceptable. · The minimum percentage of required profit, % – Specify the value 0.001%. · Use the tariff for revenue calculation – This allows you to adjust routing so that vendors having prices equal to or higher than defined in this tariff will participate in the routing. Please refer to the Routing margin tariff section in PortaBilling® Administrator Guide for details. · Send alerts about calls with losses – Select this check box to receive real-time email alerts whenever a customer (with this routing plan assigned) makes a call on which you lose money. Your wholesale customers’ remote gateways are represented as accounts and are therefore billed according to the products you create for those accounts. 1. On the navigation menu, select Service catalog and click Products. · Name – Type in a short name for the product object; this is the name you will then see in the select menus. · Name visible to end users – Specify the name of the product that your customers will see on their self-care interface. · Product type – Choose Main product here. · Currency – Product currency; only tariffs which have the same currency will be permitted in the rating list. · Managed by – Choose Administrator only here, since we are setting up a service without the involvement of resellers. · Account default ACL – Choose an Access Control List (ACL) for accounts with this product assigned. ACLs control which objects end users can access and which actions they can perform. · Account role – Select the IPv4 address from the list. Define which service types are included in the product. A service type is a description of the physical service provided to end users. 1. On your product’s panel, click Services. 3. In the Select services to add dialog box, select Voice calls and click Add. Define the default values of service attributes for all accounts which this product will be assigned to. The configuration of a limit on simultaneous calls represents a good example of service attributes definition. The rating list on the Usage charges panel has two functions: it defines permitted access points (nodes and access numbers) and specifies which tariff should be used for billing in each of these points. 1. On your product’s panel, click Charges, then click Usage charges. 2. On the Usage charges panel, click Add. · Access code – Leave this field empty for the basic SIP service. · Tariff – Choose the tariff that will be used to calculate the charges for outgoing calls. On the Charges panel you can define special pricing such as volume discounts, regular payments such as subscriptions, and set up overdraft protection. To access this panel, click Charges on your product’s panel, then click General info. Use the slider to turn on / off overdraft protection. For obvious reason, turning off overdraft protection is not recommended for general use. This allows you to choose a subscription plan for the product, so that this subscription plan will be automatically applied to every account with this product assigned. Select None as no subscription plan is specified for this service. This allows you to assign a discount plan for the product. Select None as no volume discount plan is specified for this service. 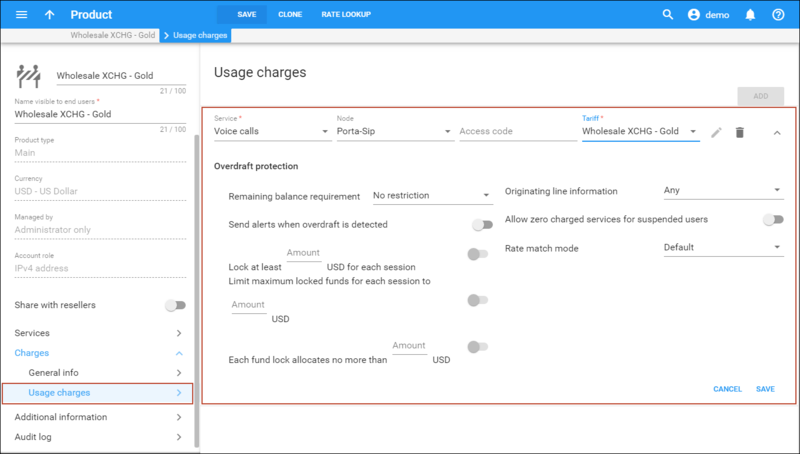 (In the General Configuration Tools section you can find examples for setting up volume discounts). Define additional settings for the product. 1. On your product’s panel, click Additional information. 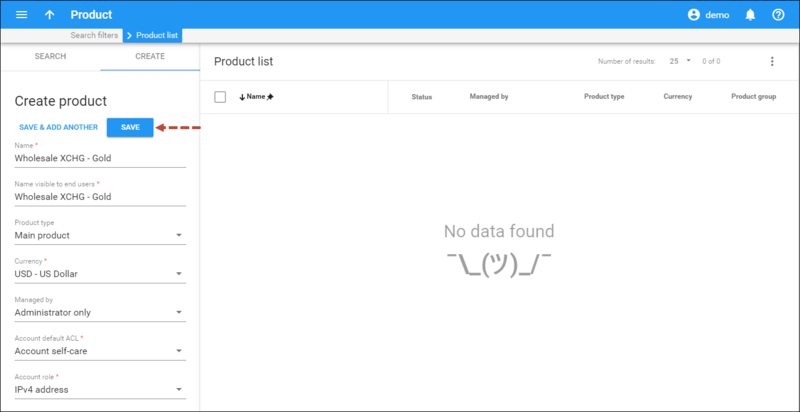 · Notes – Open the Notes panel to make notes about the product. · Product group – A product group is a custom grouping of add-on products on the account self-care interface. Select None for this product. · Account default ACL – The access level assigned by default to new accounts created with this product. The ACL determines which operations may be performed by accounts on the self-care pages. The default ACL value “Account self-care” allows all possible operations. · Information URL – If you have an external server with a description of product features, enter the URL here (e.g. http://www.myproduct.com). Your customers will be able to go there from their self-care page. · Description – Your internal comments about the intended use of this product. · Description visible to end users – Provide a product description to be shown to end users on their self-care interfaces. At the end of the billing period, PortaBilling® can produce invoices for your customers. An invoice reflects all transactions (calls, payments, refunds, subscription charges, and so on) that occurred during a specific period. It serves as the primary record of services provided to a certain customer as well as the primary record of his status. To enable invoice generation you need to create a template for the invoice layout first. Even if you do not plan to distribute invoices to customers (e.g. invoices are produced by an external accounting system), it is still a good idea to create a template and use the word “statement” instead of “invoice.” This way your customers will always have up-to-date information about their history of service consumption. 1. On the navigation menu, select My company and click Templates. · Name – Type a name for the template object; this will be used on the web interface. · Template type – Select Invoice. If you calculate taxes for your customers using an external taxation company (e.g. SureTax or Avalara), it is necessary to configure the respective taxation method. 1. On the navigation menu, select Financial and click Taxation. 2. On the Taxation panel, select Taxation plugins. · URL – The URL for access to the SureTax API. · Login – Your login to access the SureTax API. · Key – The key to access the SureTax API. To configure taxation via the Avalara plug-in, please refer to the Configuring Taxation with Avalara handbook. If you include taxes in your rates, it is necessary to define which taxes will apply to your customers. · Name – Type in the name of the tax. This will be visible in the xDRs and in the taxation configuration for customers. · Rate (%) – Specify the rate value for this tax. · Applied to – Select which services this tax will be applied to: usage charges, recurring charges or all charges. A customer class provides the ability to define the business model and a group of parameters in a centralized manner, and then apply those parameters to many customers simultaneously. · Name – Type a short name for this customer class. · Currency – Specify the currency in which you want to set the Collection threshold. When specified, this customer class can only be assigned to customers with the same currency. Once the currency selection is saved, it cannot be changed. · Business model – Select which customers this customer class will apply. Select SIP trunking from the list. · Description – Type your comments about the intended use of this customer class. 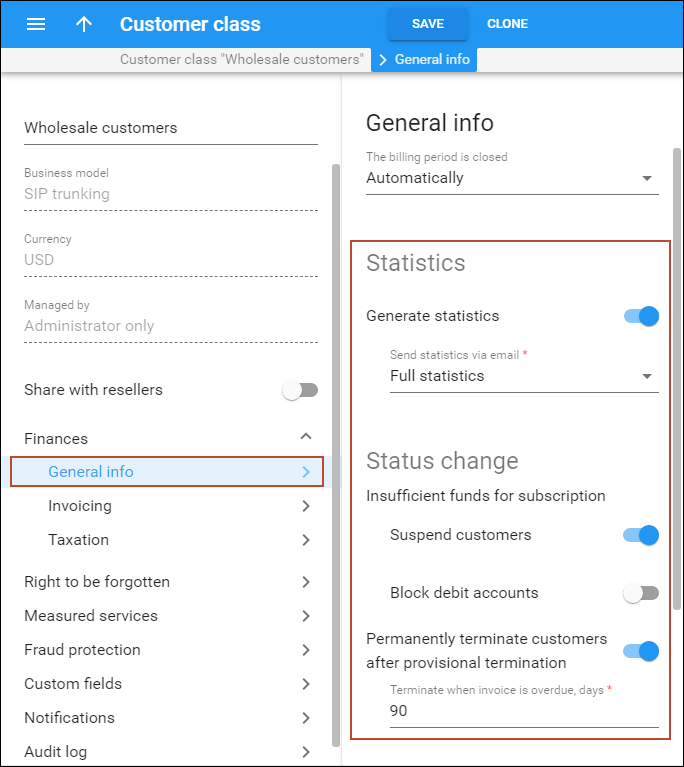 o Generate statistics – Leave this option enabled to generate invoices for customers who belong to this customer class. 1. On your customer class panel, click Finances, click Invoicing, then click Regular invoices. · Use regular invoices – Enable this parameter to generate regular invoices for customers who belong to this customer class. · Invoice template – Select the appropriate template which will be used to create a .pdf file with the invoice for your customers (e.g. Wholesale customers invoice template). · Generate invoice pdf – Leave the default option At the end of billing period selected. · Send invoices via email – Select Automatically to automatically send an invoice to a customer at the end of a billing period. · Configure Payment terms, Payment collection and Action upon non-payment parameters for customers. Please consult the PortaBilling® help for a description of parameters available here. 3. On the Out-of-turn invoices panel, specify the invoicing parameters for the customer class as described in the previous step. 1. 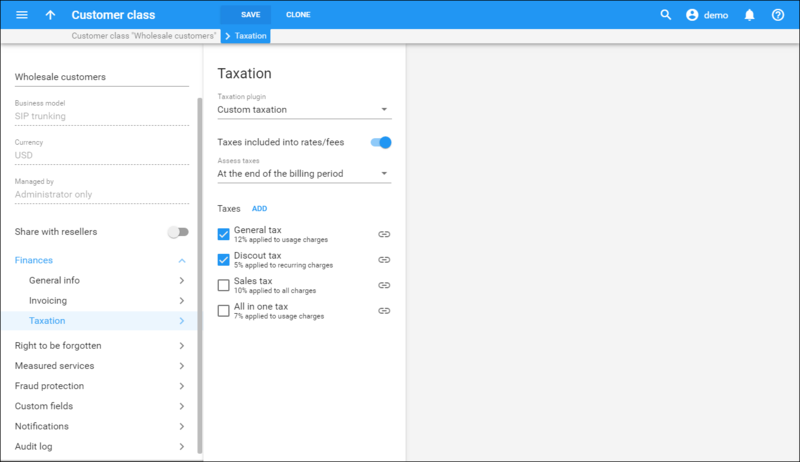 On your customer class panel, click Finances, then click Taxation. 2. On the Taxation panel, select one of the available taxation methods and specify the taxation parameters for it. For the Fixed VAT Rate or Custom taxation methods, enable the Taxes included into rates / fees option and taxes that are calculated. A customer is a company which sends you traffic for termination and pays you according to the amount of traffic sent. The customer’s contact information is used to distribute account usage information, call statistics, invoices, and so on. In this example we will describe how to create a new customer manually, without using a Quick Form. · Business model ­– A business model defines what type of service is to be provided to the customer. Select SIP trunking for this customer. · Customer class – Customer class allows you to define a policy for automated payment collection. By choosing a specific class here the customer will automatically inherit all of the class properties (grace period, invoice template, etc.). Select the previously created customer class. · Balance control - Specify the way the customer will pay for the service: Postpaid – after consuming the services; Prepaid – prior to consuming the services. Select Postpaid in this field. · Credit limit – Assign a credit limit for the customer. Define the customer's personal information (such as name, email address, and etc.). 1. On your customer’s panel, click Personal, then click General info. 2. On the General info panel, fill in the customer’s personal information and an email address for the receipt of accounting information. After the billing period is over, a list of xDRs and other statistics will be sent to this address. 1. While on the General info panel, click Address info. 2. On the Address info panel specify the customer’s address. In the BCC field type in the email address of your account representative. They will receive a copy of every outgoing email sent to the customer; this may be used for debug and archiving purposes. Define credentials and preferred settings (such as language, time zone, date input and output formats) for this customer's self-care interface. 1. On your customer’s panel, click Personal, click General info, then click Web self-care. 2. On the Web self-care panel, define credentials for the customer self-care interface (such as login, password, time zone, etc.) and other preferred settings. Define whether to suspend the customer when their balance is insufficient to cover subscription charges. 1. On your customer’s panel, click Finances, click General info, then click Subscriptions. 1. On your customer’s panel, click Finances, click General info, then clickCredit limit. · As a percentage (e.g. 90%). The warning will be sent when the customer’s balance exceeds that percentage of his credit limit. So, if the credit limit is USD 1000.00 and the threshold is 90%, a warning will be sent as soon as the balance exceeds USD 900.00. This is only applicable when the customer has a positive credit limit. · As an absolute value. The warning will be sent as soon as the balance goes above the specified value. Define whether to send this customer their statistics and invoices by email. 1. On your customer’s panel, click Finances, and then click Invoices and taxation. 2. On the Invoices and taxation panel, set the Send Statistics via email option to Summary only. This delivers a call summary only and do not attach a details file; this could be useful in the case of a large number of calls. Other options are Full Statistics (attach a complete list of xDRs) or Do not send (this option prevents the delivery of event statistics to this customer via email). 1. On your customer’s panel, click Services. The Services panel provides an access to a group of panels where you can activate / deactivate various features of the voice calls service provided to the customer. This is a convenient way for managing parameters which are the same for a whole set of accounts. 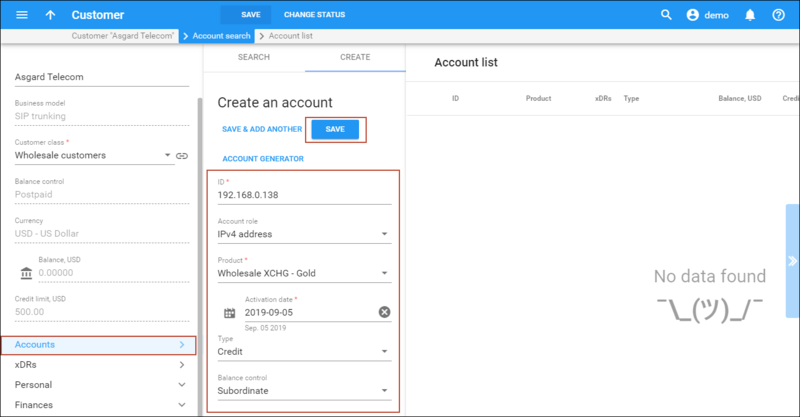 Instead of trying to configure them for each individual account, you can define them once at the customer level, then specify in the account configuration that the value in the customer’s configuration be used. Should you wish to change this value later, you need only modify it once for the change to be automatically propagated to all accounts. Please consult the PortaBilling® help for a description of parameters available here. For now you may leave these with their default values. If you change them later, these changes will automatically affect all accounts created under this customer. · via remote gateway (or proxy) IP address. In the following examples, we assume that you are using the IP authentication method. In this case, the account ID must be identical to the signaling IP address of the remote gateway / proxy. If your gateway supports SIP digest authentication, the account ID can be either the alphanumeric string or the gateway’s IP address. · ID – The IP address for the customer’s proxy or gateway. · Account role – Select IPv4 address from the list. · Product – Choose the main product, which you would like your account to have. · Activation date – Choose the date from which the account is usable. By default the account is activated immediately upon creation. · Type – Select Credit in this field. · Balance control – Define the way the balance of the account is controlled. Subordinate – the balance will directly depend on the customer’s balance (only the customer tops up the balance); Individual credit limit – this account may have its own balance and credit limit (the customer credit limit still applies.) Select Subordinate in this field. 1. On your account’s panel, click Services. On this panel, you can activate / deactivate various features of the voice calls service provided to this account (e.g. assign a routing plan, etc.). Please consult the PortaBilling® help for a description of parameters available here. 3. Repeat steps 3-6 if the customer has more than one signaling IP address of the remote gateway / proxy. 2. On the Search account panel, search for the required account and click the account ID. You are redirected to the account management panel. 3. On the account’s panel, click Services, then Service configuration. 4. 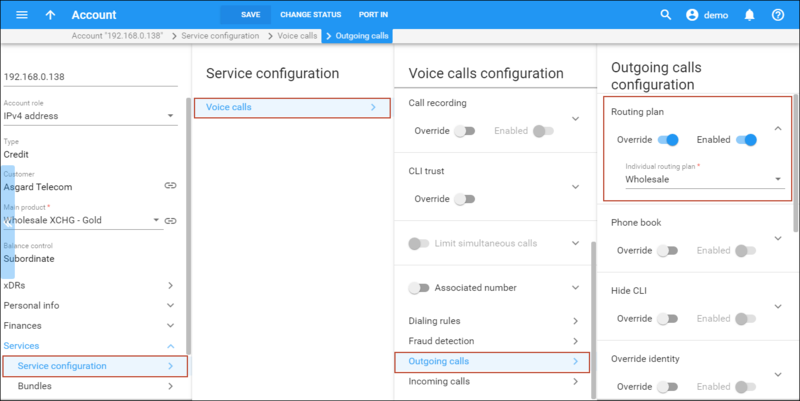 Navigate to the Outgoing calls configuration panel. 5. 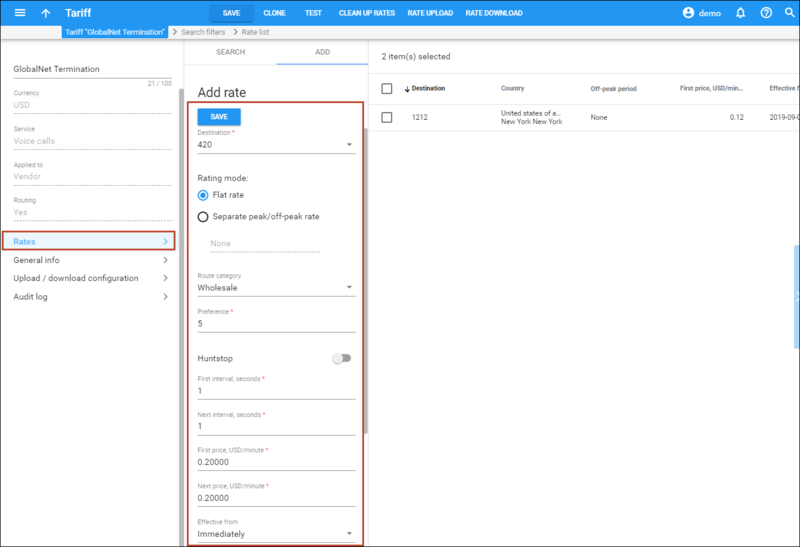 Use the Override and Enabled sliders for the Routing plan service feature in the Outgoing calls configuration panel. 6. Select the routing plan for this account from the list. You may check the routing in your system prior to actually making a phone call. This significantly simplifies troubleshooting, especially when test calls are to be performed by the customer, who may be not available at the moment. 1. Switch to the Old UI. 2. 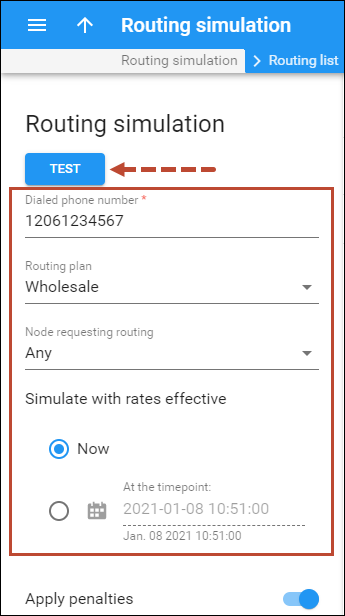 In the Routing section of the Admin-Index page, choose Test Dialplan. 3. Enter the destination phone number, service type and choose a specific routing plan. 4. Click Search to display a list of applicable routes. Make sure that the PortaBilling® Radius and PortaSIP® servers are running. 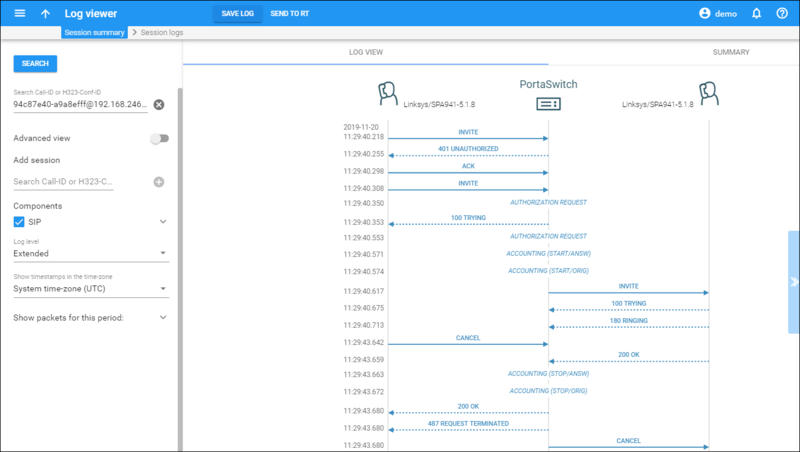 Configure the remote gateway or SIP proxy to send calls to your PortaSIP® server (make sure the authorization username and password are also configured on the remote side). Initiate a call and monitor the results in PortaBilling®. · The ability to switch to the advanced log view if deeper investigation is required. 1. On the navigation menu, select Toolbox, then select Trace session. 2. 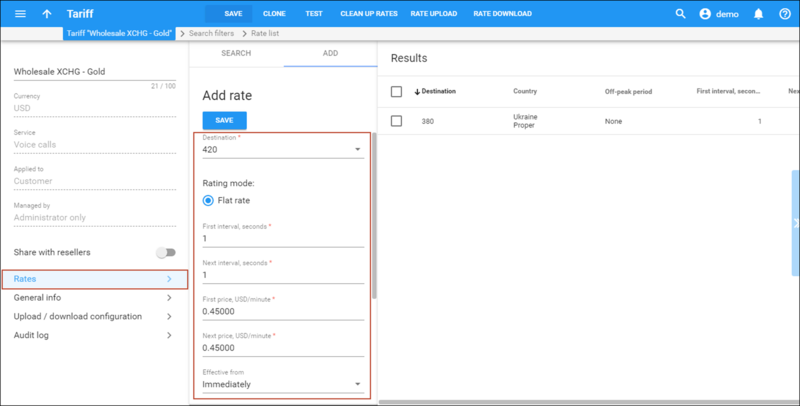 On the Search session panel, specify the Time interval and Service type search criteria. To narrow the call log search, extend the search query by enabling additional filters and defining their values. 3. Click Apply filters to produce the call attempts list. 4. To obtain a detailed log view, click the next to the call you are interested in. 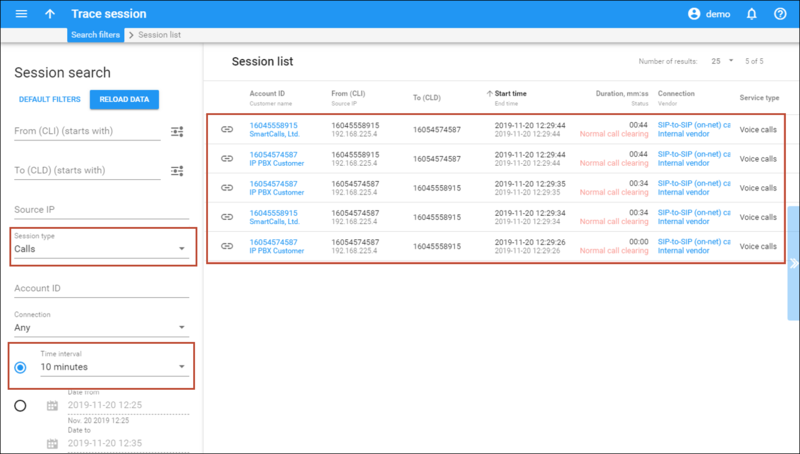 The Session logs panel opens, displaying general information about the call in the form of a diagram. 5. If deeper investigation is required, switch to the Advanced log view. In the lower frame you will see a detailed copy of all messages in this call. The upper frame provides a call-flow diagram, representing the main participating entities (SIP phone, SIP proxy, B2BUA, remote SIP UA, etc.). If you click on a particular dialogue element here, the lower frame scrolls automatically to display the corresponding message. This step demonstrates how to set up a bilateral traffic exchange, e.g. when you receive traffic from and send traffic to one and the same company. In this case the company is represented in the system as both a vendor and a customer. The following example better illustrates how this scenario works. You have the following agreement with one of the VoIP companies (let’s call it GlobalNet): you terminate GlobalNet traffic to the United Kingdom with a tariff rate of 0.1 USD per minute; GlobalNet terminates your traffic to the USA with a tariff rate of 0.11 USD per minute. Therefore, the GlobalNet company will be presented as a vendor in the system (as it terminates calls for you) and also as a customer (since they will send their traffic to your network for termination). To simplify the mutual settlement for customer and vendor entities that represent one and the same company in the system, perform the following offset. 1. In the left upper corner click to open the navigation menu. 2. On the navigation menu, select Infrastructure, then select Vendors. 3. On the Vendor list panel, select the vendor you have a bilateral traffic exchange with (GlobalNet in our example). 4. On the vendor’s panel, select General configuration. 5. From the Offset balance with customer link select the customer that you have created previously (GlobalNet in our example). 6. In the Minimum amount to offset field specify the threshold value for automatically offsetting the vendor’s balance. When the balances of both the vendor and the associated customer reach the threshold value, PortaBilling® chooses the lesser of two balances and decreases both customer’s and vendor’s balances by this amount. The xDR records for both the vendor and the customer will be created for this transaction.